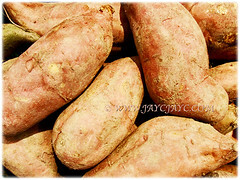 Sweet Potato is widely cultivated for its storage roots as it is an important food crop in many regions around the world. In Malaysia and Singapore, an assortment of colourful sweet potatoes are popularly cooked in coconut milk as ‘bubur cha cha’ with yams, pearled sago, bananas, black-eyed peas and flavoured with pandan leaves. It can be served hot or cold. 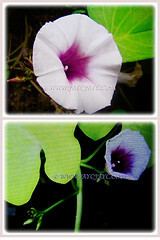 Botanical Name: Ipomoea batatas (syn. : Aniseia edulis, Aniseia batatas). Common Names: Sweet Potato, Sweet Potato Vine, Keledek in Malay. Etymology: The genus Ipomoea is from the Greek words, ips meaning worm and homoios meaning worm or bindweed and homoios meaning to resemble in reference to their worm-like twinning plant habit. 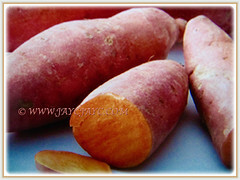 The specific epithet balatas is derived from the Haitian name, batata for sweet potato. Origin: Native to tropical America. It is widely cultivated around the world. 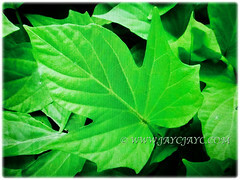 Plant type: An ornamental, herbaceous and perennial vine. Features: Ipomoea batatas is from the genus Ipomoea that comprises of approximately 500-600 species. The plant is a herbaceous perennial vine with a creeping habit and has stems that are usually long and trailing. It reaches up to 0.30 m tall and spreads between 2.44-3.05 m long, rooting in the ground at the nodes as it goes. 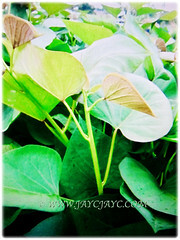 It bears green, heart-shaped or palmately lobed leaves that vary in shape. Leaves are spirally arranged along the stem and borne on long petioles. 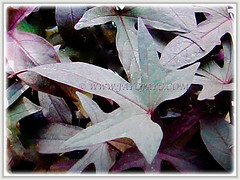 Some varieties or cultivars have yellowish or purplish leaves. Stems are prostrate or ascending, slender and occasionally twining, up to 4 m long and producing a milky juice. Many lateral stems arise from each main stem. The medium-sized sympetalous, pale pink to violet or purplish flowers are borne singly or in inflorescences known as cymes in the axils of the leaves. They are funnel-shaped and axillary. Though flowers are showy, it rarely blooms. Its root system is fibrous with adventitious roots, some of which undergo secondary thickening to form enlarged tuberous roots which serve as storage organs. These much-enlarged storage roots known as sweet potatoes are edible and variable in shape, size, number and skin colour. Its shape may be from fusiform to oblong or pointed oval. It has a smooth skin whose colour ranges from white, beige, yellow, brown, orange, purple and red. 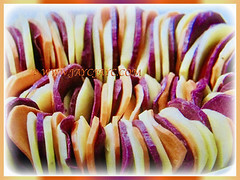 Its flesh colour includes white, yellow, orange, pink, violet, purple and red.Sweet potato cultivars with white or pale yellow flesh are less sweet and moist than those with red, pink and orange flesh. The dehiscent fruit is a 5-8 mm long capsule containing 1-4 seeds which are black with very hard seed coats. 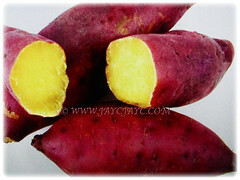 Culture (Care): Ipomoea batatas or Sweet Potato can be grown easily with least maintenance. Light: Full sun or semi-shade. However, best leaf colour usually happens in full sun. Moisture: Moderate water requirements. It does not tolerate waterlogging. Others: It does not require any pruning. Once monthly, feed the vine with a balanced liquid fertiliser to stimulate growth and fruit production. Generally free from serious pests and diseases. However, watch out for thrips, flea beetles, Colorado potato beetle, Potato weevil, Lena trilineata, Lytta atrata and Blister beetle, to name a few, may be a problem. 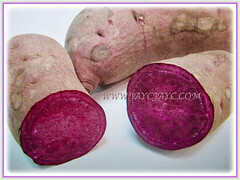 Ipomoea batatas or Sweet Potato is widely cultivated in tropical and warm temperate climates. The plant does not tolerate frost. It grows best at an average temperature of 24 °C with abundant sunshine and warm nights. The crop is sensitive to drought at the tuber initiation stage 50–60 days after planting. It’s not tolerant to water-logging as it may cause tuber rots and reduce growth of storage roots if aeration is poor. When tubers sprout in spring, cut them into sections with at least one eye per section and plant them outdoors after last frost date. Container plants and/or rooted cuttings taken in late summer may be overwintered indoors in bright sunny locations. Propagation: Easily propagated vegetatively from stem cuttings or using sprouts obtained from cuttings of storage roots. Usage: Ipomoea batatas or Sweet Potato is widely cultivated for its storage roots as it is an important food crop in many regions around the world. In many countries especially in parts of Southeast Asia, its tender leaves are stir-fried with spicy shrimp paste or simply with lots of garlic. 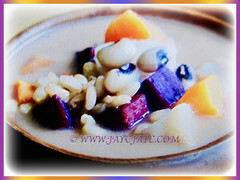 In Malaysia and Singapore, an assortment of colourful sweet potatoes are popularly cooked in coconut milk as ‘bubur cha cha’ with yams, pearled sago, bananas, black-eyed peas and flavoured with pandan leaves. Its tender leaves and young shoots which are rich in vitamins, minerals and proteins are also eaten as green veggie. 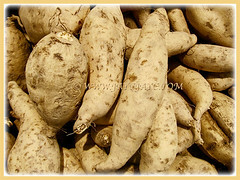 The fleshy and sweet tubers can be eaten in numerous ways, such as boiled, baked, fried and made into flour for biscuits, bread and pastries or in mashed from and used as pie filling. It can be dehydrated to make chips or creamed for use in desserts. The crop has long been grown for drying and for manufacture of starch and alcohol in Japan. A decoction of its leaves are known to be used in folk remedies for tumors of the mouth and throat. The plant is also used for other ailments, including asthma, fever and nausea. Excellent as a sprawling ground cover vine. Also, ideal to grow this beauty in a container and allow it to hang down over the edge of the container or window box.